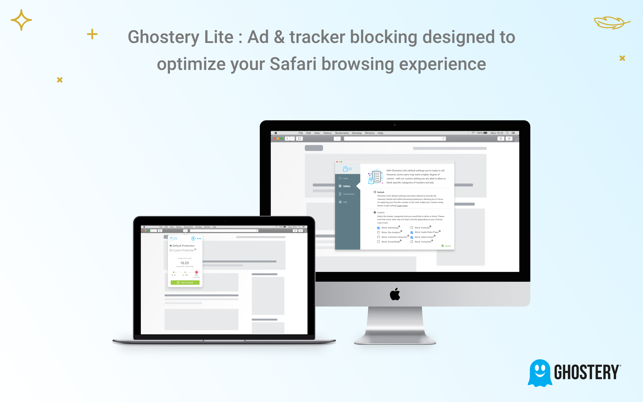 Ghostery Lite for Safari provides fast, simple and safe browsing. 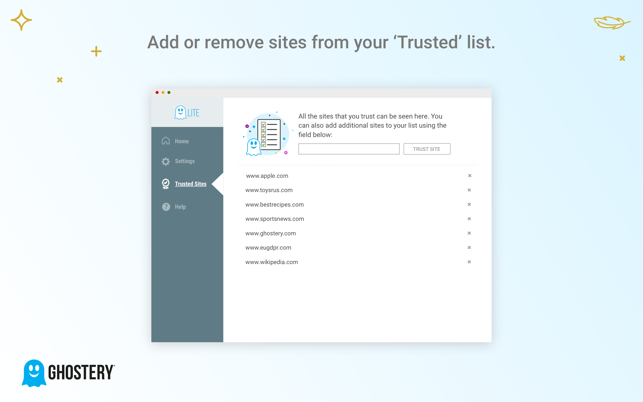 It protects your privacy online by stopping trackers from accessing your personal data and blocks ads to keep the websites you visit clutter free. It delivers the tracking protection our users have come to know and love but with minimizing the need for customization or maintenance. 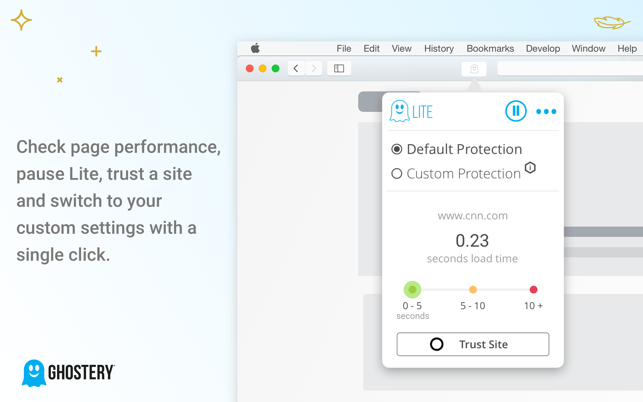 We created tailored default settings that offer immediate tracker and ad blocking upon installation and do all the heavy lifting behind the scenes, allowing you to visit the websites you love without any hassle. 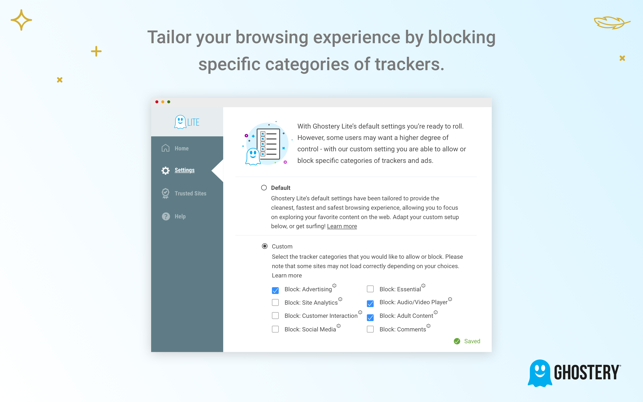 We've also included custom settings for users who would like to select specific tracker categories to block and unblock. Happy browsing! 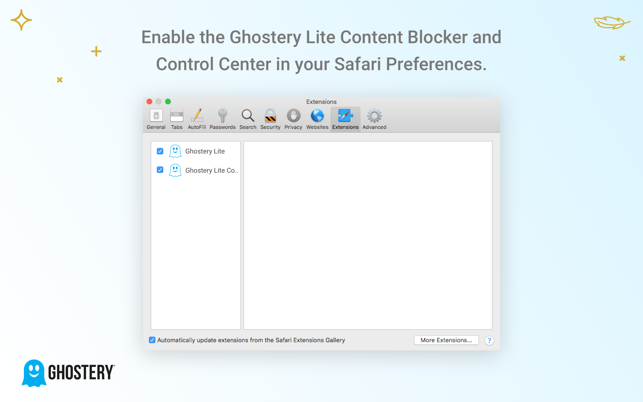 While uBlock Origin may have been the best ad block plugin for Safari prior to the new App Store method, GhostryLite is almost as good. I've tried AdBlock, AdBlock Plus, Ka-Block, etc. and all either break websites are or too slow to be useable as they load complex sites with lots of ads. AdBlock for Safari is my second choice after Ghostry. Ghostry is extremely fast and accurate. The only thing that could make Ghostry better is to do a better job of collapsing blocked ads which currently show mostly as empty squares taking up space on the screen, otherwise nearly perfect! For those overly concerned about security and the pugins access to your private web info (as I am), you can simply enable the 'content blocker' extension in Safari and leave unchecked the 'UI' extension, Ghostry will continue to work just fine this way - note this is true for all ad blockers using the new extention method that have both an engine/blocker and a UI extension. Finally An Ad Blocker That Just WORKS !!! I've been looking for a new ad blocker for a while now that I upgraded to Mojave and Apple had their new rules. The old, reliable ones I use to use just weren't working. I found a couple that I paid for that I "thought" worked but it turned out they had their other issues. Then I stubbled across this ad blocker and behold — IT WORKS and doesn't negatively impact my system. GREAT WORK !!! Thanks for the kind words! Happy browsing! I love it overall! It feels a lot faster, and I've not had any problems. I do really miss the ability to whitelist individual trackers from the in-browser popup. This made temporarily enabling widgets on websites possible when something wasn't working. Now I have to whitelist the entire site if something isn't working, which is far from ideal. Please bring this back if possible, and keep up the great work!